Culture Night in Cloughjordan Culture night in Cloughjordan will be a celebration of the life and legacy of Thomas MacDonagh. 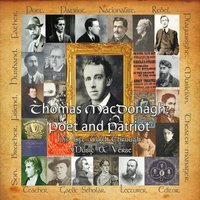 Beginning at 8 pm at the Thomas MacDonagh Centre on Lower Main Street, an assembly of artists; musicians, singers and readers will weave a rich tapestry of MacDonagh’s journey from boyhood to patriot. The event is based on the inspiring work of Martin Butler – from Newtown, Cloughjordan and now living in Boston. Martin has assembled poems and writings, songs and music that reflect the life and legacy of MacDonagh, who is, Martin says “one of my boyhood heroes, a man with an amazing capacity for life, love and friendship.” Together with John Owens, he has produced a CD Thomas MacDonagh – poet and patriot which will be launched on Friday 16th September in Cloughjordan. The CD brings together fifty-five artists; actors, playwrights, writers, musicians and singers –with several having All Ireland and Grammy Awards. The project took two years in completing the research and recording; which was carried out in USA, Canada and Ireland and has resulted in twenty-four tracks providing over an hour of listening. The excellence of the production has led to Martin and John embarking on a full length stage show based on the material on the CD. Martin is already an experienced performer and producer. He qualified for the All Ireland Bodhran in 2000, released a critically acclaimed CD with the band ‘Rud Eile’ in 2005, toured with tenor Ronan Tynan and played with Finbar Fury and The Chieftans. The first part of Thomas MacDonagh – poet and patriot reflects on the influences on the young MacDonagh and his growing interest in Irish culture and language. It is followed with insights into his poetry and his involvement in the nationalist movement – leading to Easter 1916 and his execution. This CD is a labour of love in its expanse and excellence. Revealing its contents promises to be a memorable event in the Culture Night programme.